At one point in the 1998 film “The Truman Show,” Truman Burbank sails through colossal waves in a raging thunderstorm to overcome his fear of the ocean. After being battered continuously by the elements, Truman manages to continue sailing before the violent storm abruptly stops. The intensity of the sailing at this moment in the film is matched only by the sailing in the America’s Cup, which pits the top sailors against each other in a match racing competition. The America’s Cup, also known as the Auld Mug, takes place every few years between the current holder of the Cup and a challenging boat. The first edition of the Cup occurred in 1851, when the schooner America, from the New York Yacht Club (NYYC), won a race held by Royal Yacht Squadron around the Isle of Wight, which lies in the English Channel. From that first race, the NYYC held the cup for 25 consecutive iterations of the event until 1983, where they lost to the Australia II from the Royal Perth Yacht Club (RPYC). Since then, the Cup has bounced around yacht clubs from the United States (San Diego Yacht Club and Golden Gate Yacht Club) to New Zealand (Royal New Zealand Yacht Squadron) and Switzerland (Société Nautique de Genève). Each edition of the Cup is run under a framework of rules known as the Deed of Gift. The Deed basically identifies the necessary conditions that must be met in order for a challenge to be made. Over the years, the deed has been modified several times, with changes specifying the length of boat and allowing boats to be shipped to the race location (as opposed to having to sail there). Distinct from the Deed, but based on the framework it provides, is the protocol. With each new edition, the champion provides a protocol for the race, which includes the type of boat to be used for the race, the race location, and the number of races needed to win the edition. In this way, the America’s Cup is very similar to Formula One, because it is contains the very best sailors, sailing as quickly as possible in the fastest boats and with constantly changing regulations. In recent years, the challenger has been chosen through a competition known as the Louis Vuitton Cup, where challenging boats compete in several different races in the months leading up to the America’s Cup. For the upcoming edition, there are three different events prior to the Cup used to determine the challenger. The America’s Cup World Series determines the seeding and bonus points for the America’s Cup Qualifiers, in which all of the competitors race each other in a round-robin style. The current champion of the America’s Cup is allowed to participate in this event, as a warm-up for the main event. The top four boats (not including the current champion) are then placed into a bracket, known as the America’s Cup Challenger Playoffs, and the first boat to win five races advances. The winner of that bracket is the official challenger of the 35th America’s Cup. The 34th America’s Cup, took place in 2013 on the water next to San Francisco and featured Emirates Team New Zealand (RNZYS) challenging Oracle Team USA (GGYC), with the winner being the first boat to complete nine race victories. 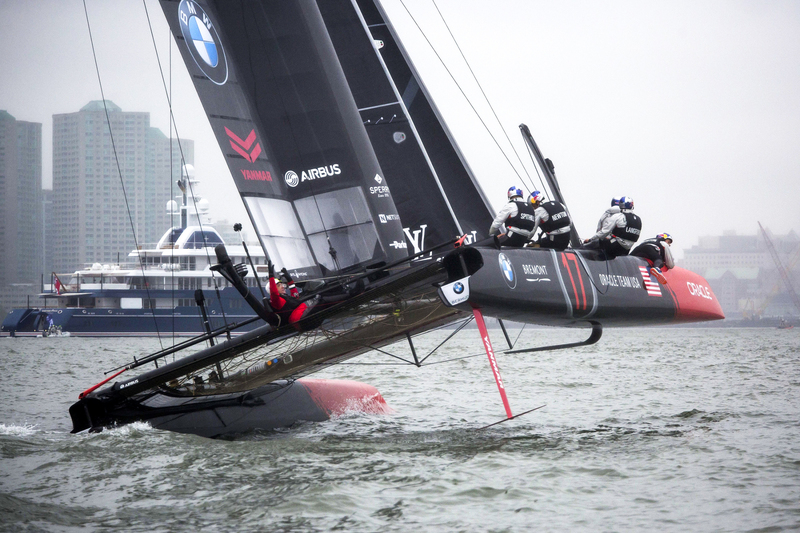 In the America’s Cup World Series, Team USA was found to have cheated, illegally adding extra weight in prohibited areas to their boat. Consequently, they were fined $250,000, three team members were removed, and the team would not score points for the first two races that they might win. This meant that Team USA would need to win 11 races in order to defend the Cup. Although Team NZ was at one point leading 8-1, in a dramatic turn of events, Team USA was able to win eight races in a row. Although the comeback was of course surprising, what was even more curious was that Team USA was on the brink of losing the Cup in the first place, given that they were favorites in spite of the penalty. The type of boats used were 72.2 foot wing-sail catamarans, boats with two hulls that could travel in the water over 40 knots (roughly 46 mph). In addition, these boats are special because they are capable of hydrofoiling, a process where a boat carrying enough speed can lift out of the water due to wing-like foils that are connected to each of the hulls. Although these boats are fascinatingly quick, they are also very expensive to design, construct, and crew. As a consequence, teams with the most amount of money tend to be very successful. It’s no surprise, then, that the team backed by Larry Ellison, the multi-billionaire owner of Oracle, pulled out the victory. This speaks to an unfairness in the America’s Cup, because ultimately, it has been not the necessarily the team with the best sailors that wins, but the team with the biggest bank account. In addition, since the champions of the Cup decide the protocol for the following edition of the competition, they can select an absurdly expensive class of boat to be raced that may potentially weed out talented but poor yacht clubs. Consider also the fact that the champions are able to start designing and constructing their boat under the new protocol before the protocol is even released. However, Mr. Ellison appears to have been satisfied by his most recent Cup victory because he, other competitors in the America’s Cup World Series, and the America’s Cup Event Authority have banded together to create a new framework for the competition that will theoretically reduce costs and provide more clarity to the type of boats being used and the rules being employed. The 35th America’s Cup will be held in Bermuda on the Great Sound, with Oracle Team USA defending the Cup. At the behest of Team USA’s protocol, the boats to be used will be wing-sail catamarans but, unlike the 34th edition, will only be around 50 feet in length (as opposed to 72.2 feet). The current challengers are: Land Rover BAR (Great Britain), Emirates Team New Zealand (New Zealand), Artemis Racing (Sweden), Softbank Team Japan (Japan), and Groupama Team France (France). The America’s Cup World Series has already been completed, taking place between July of 2015 and November of 2016, with Land Rover BAR coming out on top. Coming up next is the America’s Cup Qualifiers and the America’s Cup Challenger Playoffs, which will take place between May 26 and June 12. After the challenger has been chosen, the America’s Cup will be raced on June 17-18 and June 24-27. There is no doubt that Oracle Team USA will once again be front runners, since Mr. Ellison is still backing them. But Land Rover BAR, led by Sir Ben Ainslie, a British sailor who has won four Olympic gold medals, looks to mount a strong bid to be the challenger. Emirates Team New Zealand, which finished third in the America’s Cup World Series behind Oracle Team USA, also appears promisingly quick. Yet anything can happen on the water, as Truman Burbank knows very well.